NEW YORK The radical Islamic preacher known as Abu Hamza al-Masri and two alleged al Qaeda operatives made their first apperarances in a U.S. court on Saturday after years of fighting their extradition from Brtain. All three accused terrorists were presented to a federal magistrate in Lower Manhattan less than 12 hours after touching down on U.S. soil at 2:40am on Saturday. Abu Hamza, 54, an Egyptian-born as Mustafa Kamel Mustafa, earned infamy as an imam at London's Finsbury Park mosque, where his followers included 9/11 conspirator Zacarias Moussaoui and shoe bomber Richard Reid. Former Assistant United States Attorney Edward O'Callaghan said in an interview Abu Hamza was a spiriutal leader of the al Qaeda movement. "To commit violence and to essentially rise up and follow the al Qaeda fatwah, which was essentially to commit violence against the West," said O'Callgahan, who helped prosecute Abu Hamza's case following his 2004 indictment. Abu Hamza, who has already served six years in British prison for incitement, faces U.S. charges that he assisted a plot hatched in 1999 to establish a terrorist training camp in rural Bly, Oregon, that could have served as a base for sleeeper cells. O'Callaghan said, "The camp would have trained al Qaeda sympathizers here in the United States with U.S. passports or other western country passports and have them trained in explosives training and, frankly, soldier training." In a 2002 interview with CBS News, Abu Hamza downplayed his ties to camp organizers. "I don't know if these people, they ask me some questions, or if some of them, they've come to visit the mosque, but no structural link," he said. "I'm not from al Qaeda, and I don't recruit from any group." Flanked by U.S. Marshals, Abu Hamza walked into Manhattan federal court wearing a short-sleeved navy blue jail uniform, a gray beard, and closely-cut gray hair. Both of his arms were exposed, showing where his hands had been amputated, he has claimed, after an explosion fighting with the anti-Soviet Mujahideen in Afghanistan in the 1980s. The explosion also cost him vision in one eye. Sabrina Scroff, Abu Hamza's acting defense attorney, asked U.S. Magistrate Judge Frank Mass to order the Bureau of Prisons to return the defendant's prosthetic hands immediately so he could attend to "his daily needs." "Otherwise, he will not be able to function in a civilized manner," Scrhoff said. The attorney requested that Abu Hanza, who suffers from diabetes and hypertension, receive a full medical exam. She said he will want a dictaphone to help prepare his defense since he cannot write notes. Abu Hazma did not enter a plea. His formal arraignment is set for next Tuesday before U.S. District Judge Katherine Forrest. Also appearing in court Saturday were Khaled al-Fawwaz, 50, a Saudi, and Adel Abdel Bary, 52, an Egyptian, who are accused of key roles in al Qaeda's London cell in the 1990s. They fought extradition for 14 years, appealing to every available court in UK and Europe. Al-Fawwaz, who helped found the terror group's East Africa cell in the 1990s before moving to London, was Osama Bin Laden's chief propagandist, distributing his 1996 and 1998 fatwahs declaring war on the U.S. and justifying attacks on Americans. In the 1990s, al-Fawwaz procured a satellite phone and air minutes for bin Laden that the leader used from inside Afghanistan to contact operatives around the world. Federal prosecutors once called the communications device "the jihad phone." On August 7, 1998, al-Fawwaz faxed to select media orgzaniations al Qaeda claims of resonsibility for the twin truck bombings of U.S. embassies in Nairobi, Kenya, and Dar es Salaam, Tanzania, which killed 224 people, including a dozen Americans, and injured thousands. It was the group's deadliest attack until 9/11. "He received the statement of responsibility for the bombing three days before the bombing actually happened, so it was clear evidence that he was connected to the group," said O'Callaghan, now in private practice with Clifford Chance law firm. Al-Fawwaz and Adel Abdul Bary also wore standard blue jail uniforms, long hair, and long beards that have grayed during their incarceration. Al-Fawazz told Judge Maas he was "not guilty." Defense counsel Andrew Patel entered the same plea for Abdel Bary. The two defendants will be formally arraigned next Tuesday before U.S. District Court Judge Lewis Kaplan, who inherited the embassy bombings docket after the first four men were convicted in the conspiracy in 2001 and sentenced to life imprisonment. Kaplan presided over the 2010 trial of Tanzania embassy bomber Ahmed Khlafan Ghaliani, who was the first and last detainees at the Guantanamo Bay, Cuba, military prison transferred to federal court. Kaplan sentenced Ghaliani to life imprisonment. Assistant U.S. Attorney Sean Buckley told Judge Maas the government, which has twice won jury trials stemming from the embassy bombings, will commence to turn over evidence to defense attorneys for al-Fawwaz and Abdel Bary on Tuesday. None of three new defedants challenged their detention or made a bail application, though Patel said Abdel Bary reserved the right to do so. Defense attorneys said al-Fawwaz suffers from high blood pressure and a stomach condition, while Abdel Bary has asthma. In addition to the terror camp scheme in Oregon, Abu Hamza is accused of assisting in the 1998 abduction of 16 Western hostages, including two American tourists, in Yemen. Four hostages died in that incident. Abu Hamza is also charged with dispartching recruits and supplies to terrorist training camps in Afghanistan in 2000-2001. Abu Hamza, al-Fawwaz, and Abdel Bary all face possible life sentences. U.S. Attorney Preet Bharara called the long-awaited extraditions pursued by his office "a watershed moment in our nation's efforts to eradicate terrorism." "These are men who were at the nerve centers of al Qaeda's acts of terror, and they caused blood to be shed, lives to be lost, and families to be shattered," Bharara said in a written statement. "I'm absolutely delighted that Abu Hamza is now out of this country," British Prime Minister David Cameron said. "Like the rest of the public, I'm sick to the back teeth of people who come here, threaten our country, who stay at vast expense to the taxpayer, and we can't get rid of them." 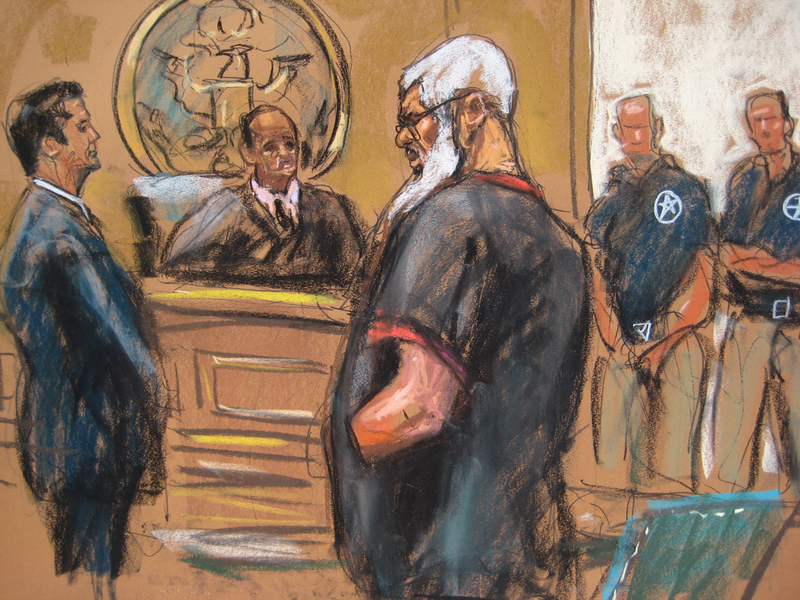 In Connecticut on Saturday, two other men extradited from Britain, Babar Hamad, 38, and Syed Talha Ahsan, 33, were presented in federal court, where they pleaded not guilty to charges of providing matreial support to terrorists in Afghanistan and Chechnya. Ahmad had been held in the U.K. since 2004.